There are some books that make you want to read them over and over again. They contain a special kind of magic that when you open them up, they invite you into their world and envelop you like an old blanket. For me, Loving You, is one of those books. The first time I read it, I borrowed it from the library and sadly it smelled like a sweaty gym sock. Somehow, I managed to put that out of my mind and finished that book (in almost record time -- maybe because of the smell). Almost immediately after finishing it that first time, I ordered my very own copy off of Amazon. I upgraded my copy to digital a few years back, but hadn't re-read it until last week. Stevie Ryan is lonely. Her best friend and sister of the heart, Carla, has just gotten married and Stevie feels like she's all alone. It is a feeling she's well acquainted with, but she'd hoped to never to feel that way again. She once thought she'd found her happy ending with Carla's brother, Nick, but that relationship ended disastrously. Paul Candellano has loved Stevie for as long as he could remember, but never acted on it because everyone knew she'd eventually go back to his twin brother, Nick. Watching his little sister get married, he decided it was time to get over his crush, but that very night is when everything changes and he finally has the chance to have his happily ever after. 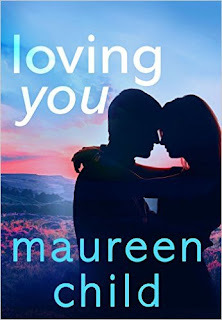 One of the things that I love about Maureen Child's books is that she has the ability to make the characters feel like family -- or at least, old friends. Loving You is no different from any of her other Candellano or Marconi novel. There's a lot of big, noisy, family dinners -- in this case supervised by Mama Angela Candellano, always ready with a hug or a slap to the back of the head, whichever better fits the situation. Another thing that I like about this book is that it is a friends to lovers story. Paul and Stevie have known each other since they were kids and have been friends for just as long. What intrigues me about this trope is that it always makes the relationship more important because if it doesn't work out, they have to deal with losing not just a lover, but a friend. This is an integral part of the story and one of the main reasons Stevie is against a relationship with Paul. She's afraid that this relationship like all of her others is going to fail and that when it does, she'd have lost one of the most important people in her life. The one thing that bothers me, however, is the depiction of Stevie's younger sister, Debbie, who is a seventeen year old girl with Down's Syndrome. First off, there is the fact that their mother hid Debbie away as if she was something to be ashamed of rather than a human being. Thankfully, once Stevie finds out about Debbie's existence, she immediately is disgusted by her mother's actions. Mostly, she feels this way because Debbie is family and to Stevie family is everything. Then there's the fact that Debbie is portrayed as being more child-like than a 17 year old girl. Yes, Down's does have psychological effects, but to me Debbie behaved more like someone on the Autism Spectrum and not someone with Down's Syndrome. There are a few other little issues that I had, but they're so minor that it doesn't make sense to even mention them.